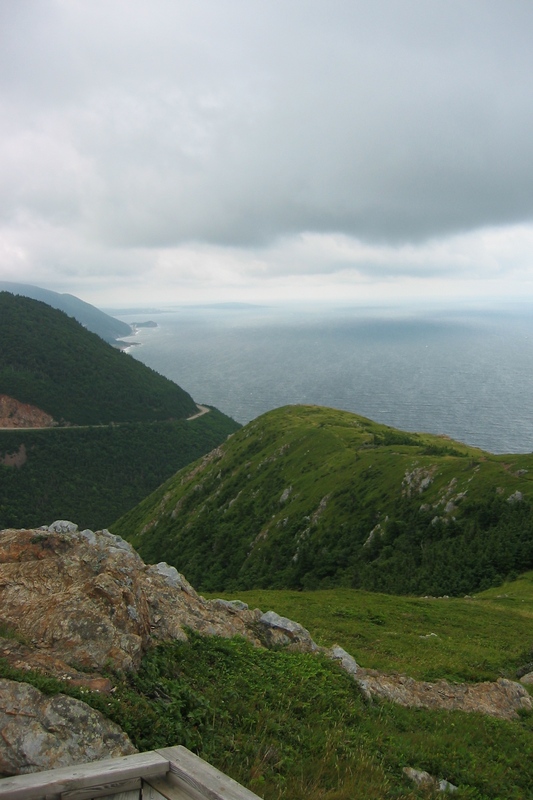 Cape Breton is an island in the northern part of Nova Scotia. 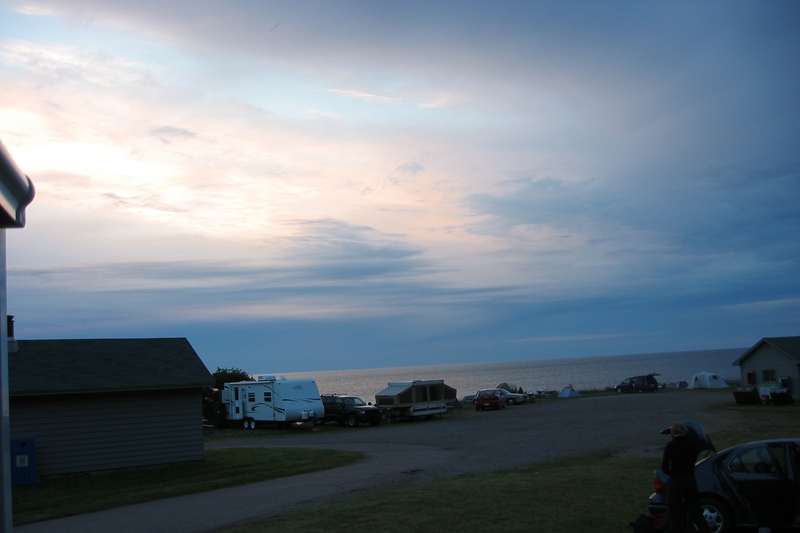 We landed at the North Sydney ferry terminal, stayed at the Harris Point KOA, and then headed west toward Cape Breton Highlands via the Cabot Trail. 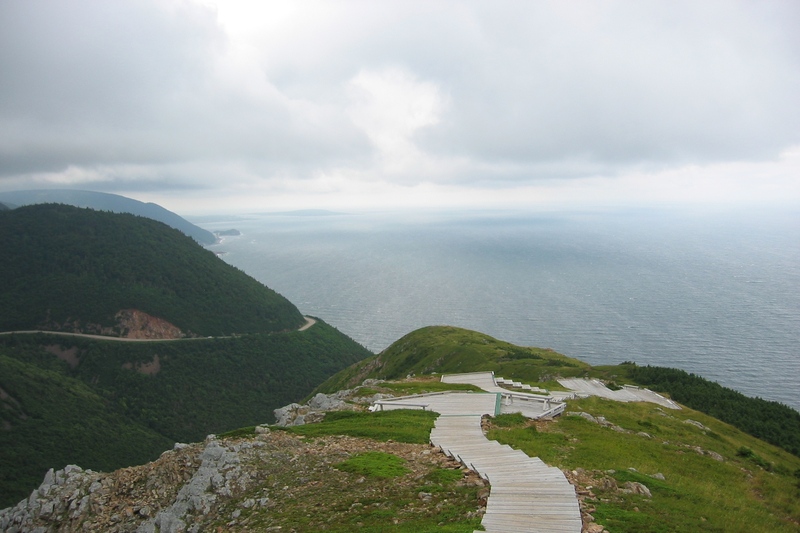 This is a view of the northwestern coastline of Cape Breton from the “Skyline” trail that leads to one of the points overlooking the St. Lawrence Bay. 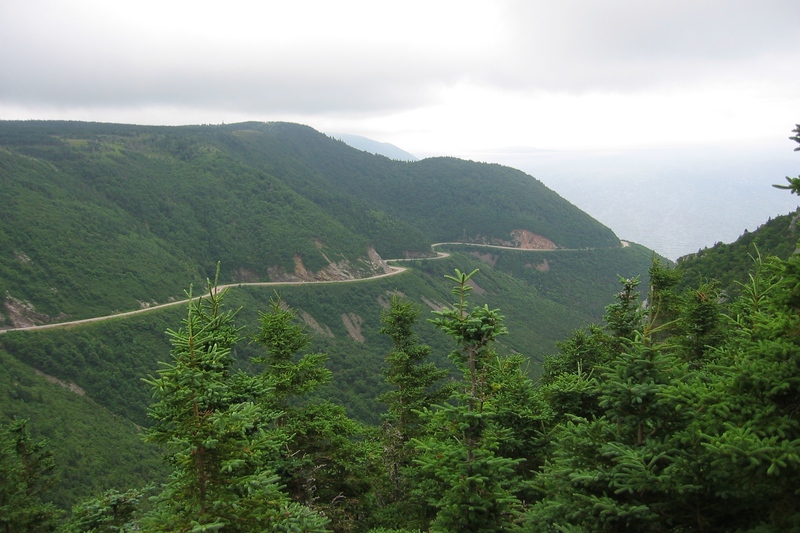 The approach to Cape Breton Highlands goes through an area of Nova Scotia steeped in Celtic culture. 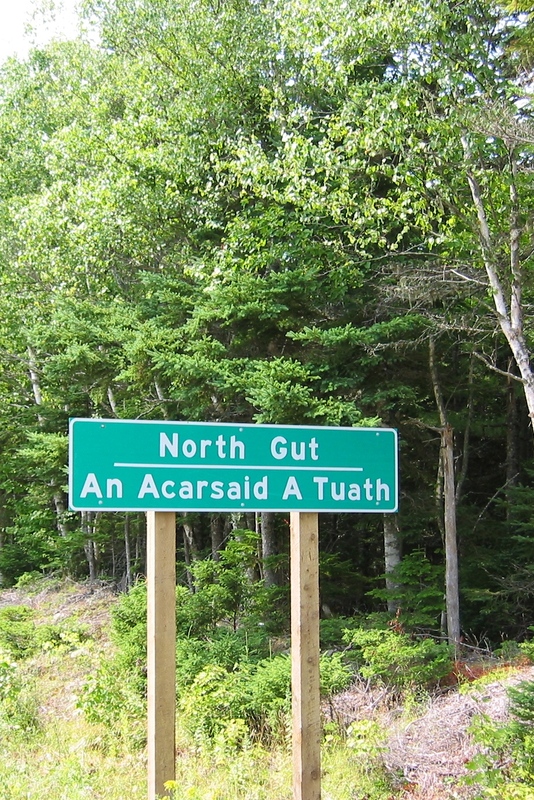 Even the location signs by the side of the road have a Gaelic translation, and there is a Gaelic college for learning traditional crafts. 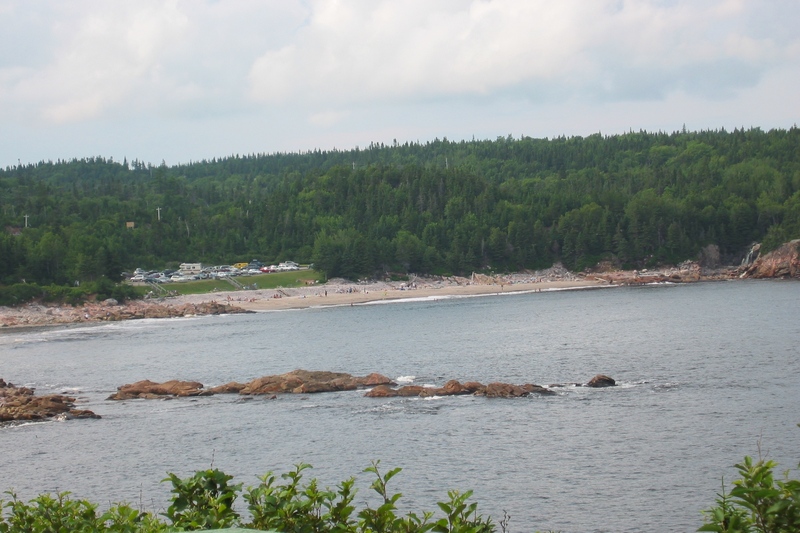 Cabot Trail leads past coves with small beaches (Ingonish Beach) and up and down steep and winding roads (Smoky Mountain). There are plenty of stopping points along the trail so that people can appreciate what they are able to see while driving. 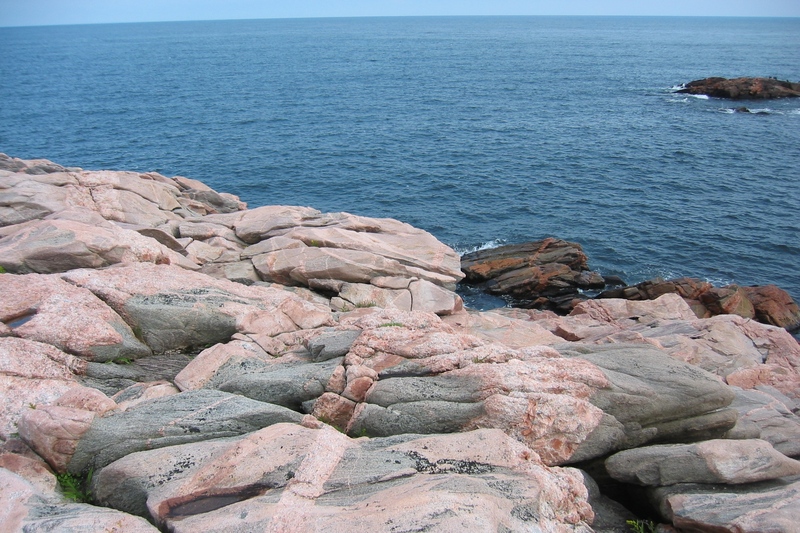 Green Cove has beautiful pink rocks within the coastline, with stripes where lava had filled cracks in the rocks thousands of years ago. The trail goes in and out of Cape Breton National Park – so we had an opportunity to stop at a local bakery (the Clucking Hen) for some fantastic bread, cookies, and date blondie bars. 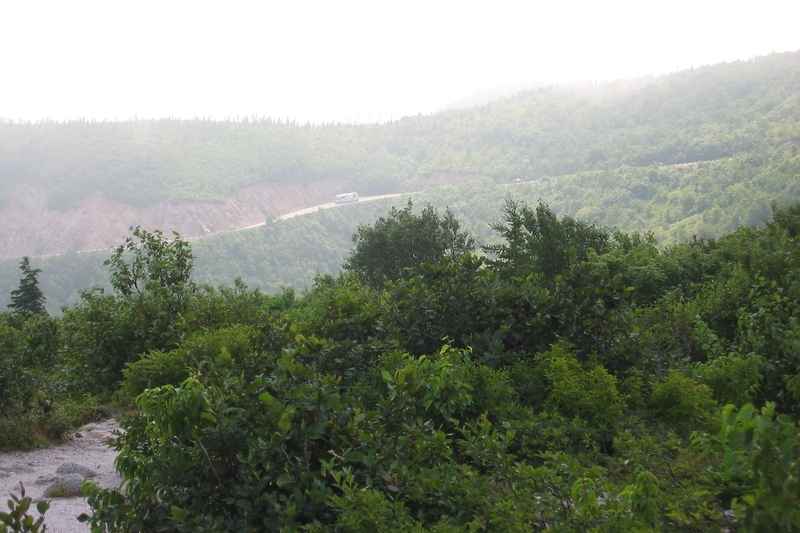 We drove across the Cape Breton Highlands portion of the park, noting where we wanted to hike the following day. We stayed in a campground within the park. We got up EARLY (for us, arriving at the trail head at 8am) the next morning and hiked the 3 hours in and out of the Skyline trail. 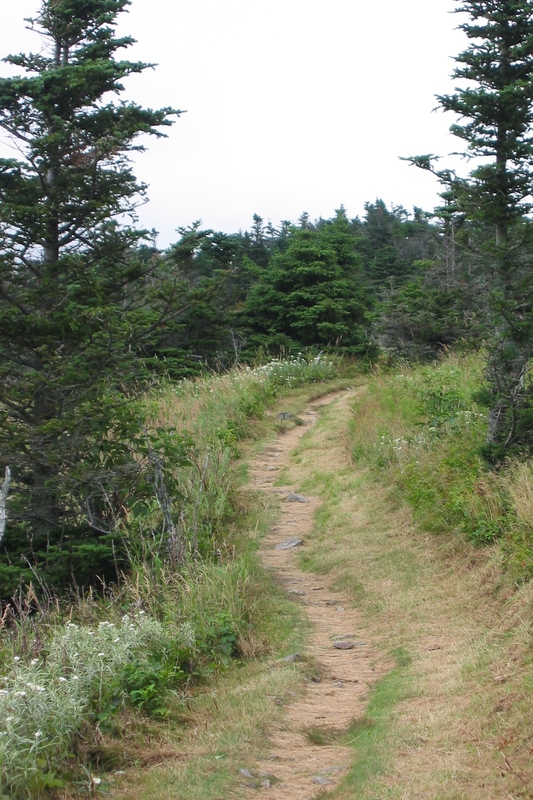 The trail in was relatively easy (gravel or boardwalk, and level); the trail out was rutted and uneven. 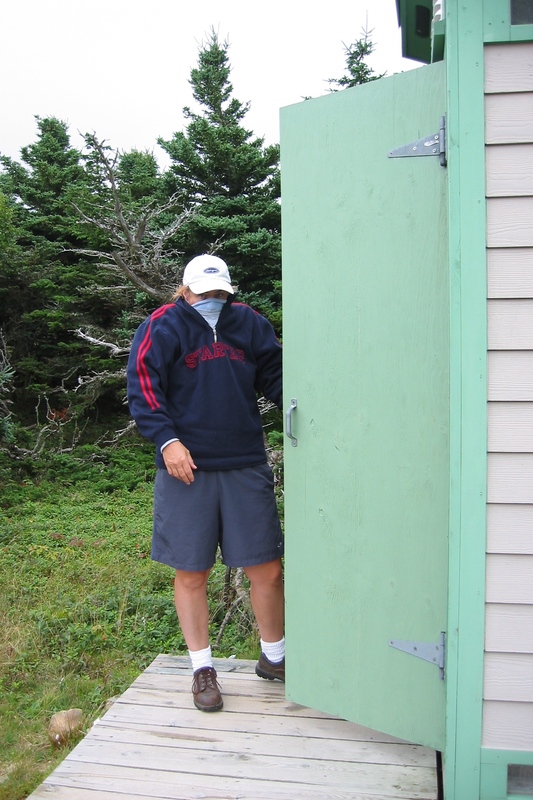 There were a few latrines for desperate hikers. When we arrived at the trail head there were only two other cars in the parking lot, and we never saw them; as we left we were passing people every couple of minutes and there were at least 50 cars parked there. It was cool and gloomy, with threatening weather, but we enjoyed the hike nevertheless. 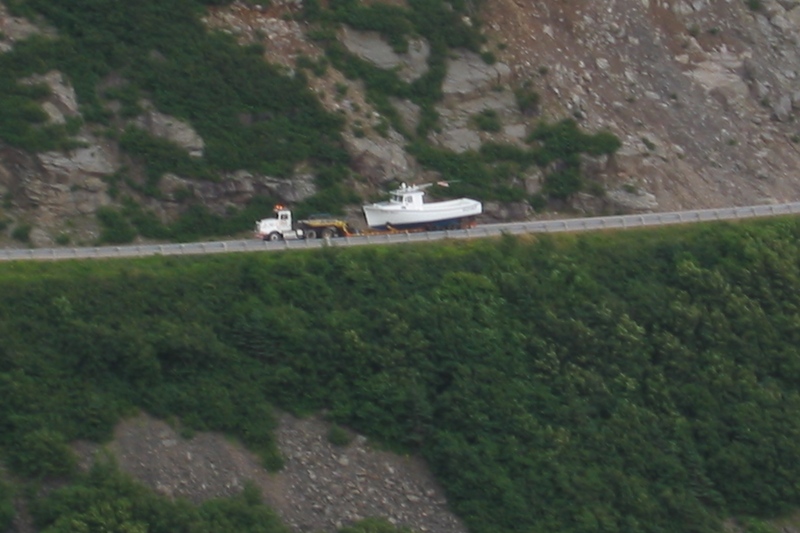 One of my favorite photos is a boat being hauled up that curvy mountainous roadway. It has a lead car with a “Wide Load” sign but – I would have been frightened to meet that boat going around one of the curves in the RV. 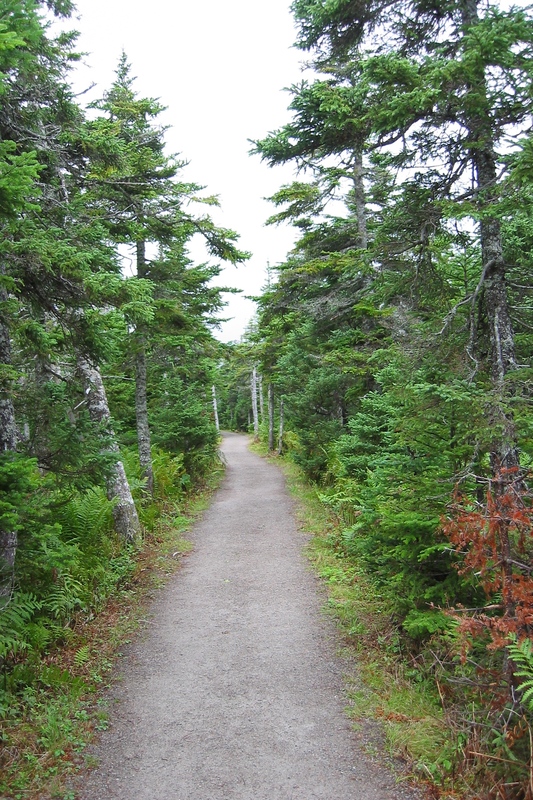 The trail winds over the top of the mountain and down a boardwalk toward the coast. Chris was worried about falling, so I had to continue to tease her about the heights. The trail was constructed so that it cannot be seen from the road below. 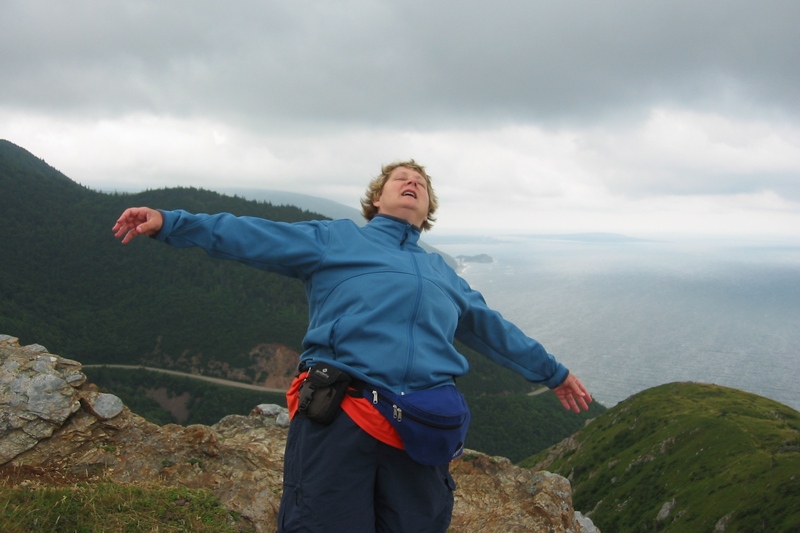 After we finished hiking, we left the Cape Breton area and drove down near Halifax, which is where we are now. It has rained for two days and the campground has WiFi, which has enabled us to do a bit of grocery shopping and catch up on our blog posting. Tomorrow we plan to tour Halifax and Lunenburg. again these past days writings and photos are fabulous. am glad you are seeing the real sights of the everyday working class there. am sure they have are fascinating to observe and speak with to learn more about their lives. how’s the rv holding out? never traveled or stayed in one and can’t imagine the changes you must still be undergoing to accomodate and exist. looks like you are still enjoying doable weather for travel and photos. keep up the good work. i feel like i am on a vacation….at last!!! The RV is great. There’s a Canadian here who bought the Winnebago version of the same one (I got the Itasca, which is like the Dodge of the Chrysler family to the Winnie). No complaints at all. It’s just the right size, and so much easier to setup and de-camp than the others around us. The diesel engine is powerful enough to make it up all the hills. We’ve found we brought more than we needed of some things, not quite enough of others. All in the learning process.